File Name: Kurt Schnurr of New Haven, Connecticut. Notes: New Haven is on the coast of the state, about 20 miles east of Whiteout's home of Bridgeport. Stretcher is also from Connecticut, born in Hartford. 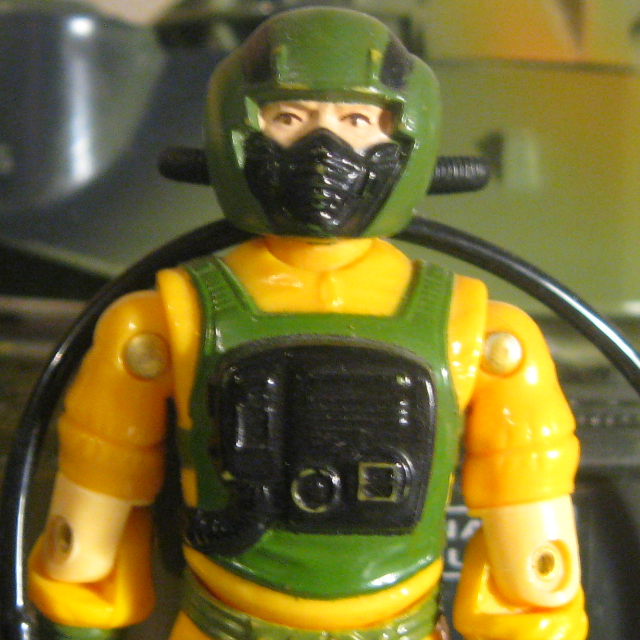 Sunbow's Airtight wore his 1985 outfit, but usually with a paler yellow than on the figure. He was often seen without his helmet, with brown-to-black hair and a prominent widow's peak. Flint's Vacation 23 seconds 1 line at HQ during broadcast; on Flagg and in Killer W.H.A.L.E. Accessories: black "Sniffer" CBR sensor (new), olive compressor bakcpack with air intakes on sides (new), long black hose (common), black notched air hose with peg at each end, fits onto back of helmet (new). Kurt was the kid who could hold his breath the longest. He was also the kid who had the largest collection of plastic dinosaurs on the block. He was a weird kid who grew up to be an even stranger adult. It takes a mighty weird person to walk into a cloud of toxic gas strong enough to fell a mutant weight-lifter cockroach wearing a protective suit built under contract for the government by the lowest bidder. "Airtight is an unreformed practical joker; sneezing powder, plastic barf, whoopee cushion - the whole bit!! No prank is too low for him. You'd think that other Joes would hate his guts, but they don't. Because when the bad guys escalate the fire fight and start playing dirty, it's old Airtight who suits up and wades into the thick of it." Toy Notes: Item #6439. Featured in 1985's Check Point/Air Defense commercial. Accessories: black pistol (06 Med Alert's), black laser rifle (06 Grand Slam's), silver clamshell visor with nose notch (new), clear figure stand (common). The G.I. JOE team has to be ready for any kind of attack from COBRA forces, including dangerous substances created by the fiendish DR. MINDBENDER. That's where AIRTIGHT comes in. He's a trained expert in chemical weapons, and knows how to detect, identify, neutralize, and contain them. He keeps the team prepped for any eventuality, especially since COBRA is evil enough to attack with every nasty method at its disposal. When a toxic gas has been unleashed, it takes a courageous and coolheaded person to walk in and neutralize it, even when he's suited up in Level 4 M.O.P.P. (Mission Oriented Protective Posture) gear made of impermeable, charcoal-saturated polyurethane foam. AIRTIGHT is the guy for the job. When COBRA comes at the G.I. JOE team with their worst, he's there to save the day. "Dealing with a dangerous toxin is only part of the mission. The other part is capturing the enemy who released it in the first place, and make sure they never do it again." Toy Notes: Sold exclusively through the G.I. Joe Collector's Club.